Liz Argall’s Things React to A Wrinkle in Time! Here is the multi-talented Liz Argall with another special Uncanny edition of her webcomic Things Without Arms and Without Legs, where they once again react to a piece in an issue of Uncanny Magazine. For Issue 22, Liz’s Things react to Briana Lawrence’s essay “At Face Value” about A Wrinkle in Time! Liz Argall’s Things Respond to Gender Expectations! Here is the multi-talented Liz Argall with another special Uncanny edition of her webcomic Things Without Arms and Without Legs, where they once again react Uncanny Magazine. For Issue 20, Liz’s Things are responding to the nature gender expectations in the world, and why spaces like Uncanny are necessary. Liz Argall’s Things React to Elemental Love! Here is the multi-talented Liz Argall with another special Uncanny edition of her webcomic Things Without Arms and Without Legs, where they once again react to a piece in an issue of Uncanny Magazine. For Issue 19, Liz’s Things react to Rachel Swirsky’s story “Elemental Love“! Guest Post! Liz Argall Is Launching a Patreon! Liz Argall’s Things React to Space Unicorns! 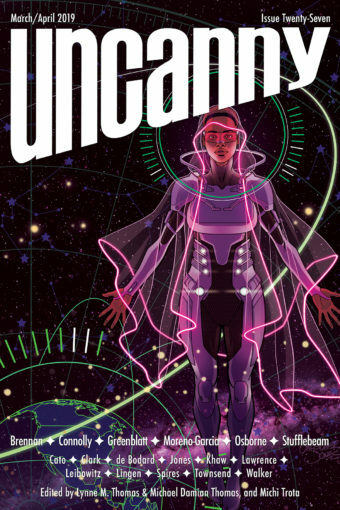 As you may remember, one of the stretch goals for the Uncanny Magazine Year Three Kickstarter was a continuation of our webcomic feature. Each issue or so, the multi-talented Liz Argall will have a special Uncanny edition of her webcomic Things Without Arms and Without Legs where they react to Uncanny Magazine. Today, Liz’s Things react to Space Unicorns with an IMPORTANT QUESTION!